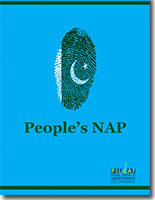 The People’s NAP is an attempt by PILDAT to delineate the 20-point National Action Plan into an easy and understandable manner for the citizens. The paper highlights the role of each stakeholder, including Governments, Parliament and Provincial Assemblies, for the purpose of facilitating greater appreciation and ownership among citizens on implementation of the National Action Plan. Our objective is that through greater understanding and ownership, citizens will demand a more systematic understanding of the implementation status of NAPat the Federal and the Provincial levels.